Our Semi-Permanent Makeup Artist is trained by the UK’s leading and most reputable authorities. The frame of the face – having the right eyebrows defines the eyes and gives a groomed, youthful appearance, allowing for a fresh complexion. At Shumalia’s, we achieve the perfect arch by using our 3-Dimensional technique this is called Microblading Eyebrows. We draw individual hairs onto the skin with hair strokes that are carefully blended in with your own, natural eyebrows. All colours are specifically developed for each client in order to achieve the perfect match. 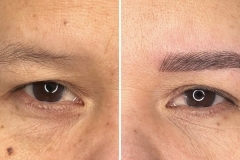 The treatment is especially effective for those who have over plucked their brows, suffer from thinned brows, or those who wish to add a shape to eyebrows that have never made a statement. Our trained professionals create a flattering shape that suits the individual face, giving the eyebrows a lift and an overall look that is elegant and polished. Who benefits from Semi-Permanent Make-Up? How long does Semi-Permanent Make-Up last? Semi-Permanent Make-up can last 9 months – 18 months depending on skin metabolism, type, and external factors such as sun damage. The more skin you shed and regenerate, the lighter the colour will be. Although this can often be further extended by the use of colour boost touch-up treatments. How many appointments will I nedd? At least 2 appointments are required, on rare occasions some people may require a 3rd appointment. We apply a local anesthesia cream where the semi-permanent make-up will be placed. Generally the process is not painful, but everyone’s pain tolerance is different. We have never had a client unable to finish a procedure because it was too painful. Will the site of the Semi-Permanent Make-Up be red? How long does that last? Usually there is minimal redness to the skin. Some people are more sensitive than others and will show some redness. For sensitive people, the redness usually disappears within 24 hours. The skin naturally heals in a weeks time and the complete results become visible. The treatment is a three-part process usually completed within two appointments. During your initial appointment our technician will go through your requirements and draw on with a makeup pencil, which can be adjusted as many times as necessary! We will never begin the tattoo process until you are completely happy with what your cosmetic tattoo is going to look like. The treatment then involves applying pigment into the upper layers of the skin – a technique known as permanent cosmetics, or cosmetic tattooing. The process normally takes 1 and a half hour, but it varies from person to person depending on your individual requirements. Immediately after a treatment you should expect the area to look 40-50% darker than the colour you have chosen. This will start to fade after 3-4 days. A second appointment is needed within 4 weeks after your first treatment. this is usually a 30-60 min appointment to add more pigment to the area. This is because as the area is healing, some parts may not “hold” as well as others and you may have a few patches that need more colour. This is completely normal and everyone heals differently.Whatever the case, we advise you always come back to the salon for your retouch.